Technology, TV shows and trendy toys make it easy to shop for kids and teenagers. But adults are a little harder to shop for every holiday season. When you’re shopping for your friends, parents, coworkers, and extended family members, it can be difficult to find the perfect gift. The nice thing about growing up is we start to value experiences more than material gifts. We want more family time, more outings with our friends, and quality time with our spouse. That’s hard to put in a stocking, though! Here’s our secret to being the ultimate gift-giver: give special, magical moments instead of things. So, how do you give special, magical moments without gifting things? The obvious experiential gifts are museum memberships, tickets to a movie or a concert, or a spa day. Those are all great gifts, but we can get more creative than that, right? Maybe you’re shopping for someone who is interested in photography, and they have a nice camera but haven’t been able to master the craft on their own. Give them the extra push they need by enrolling them in a class or a workshop where they can dive deeper into something they enjoy. Better yet, enroll with them! We’re social creatures and love to share experiences, so make the experience special by being a part of it! If your friend, coworker, or loved one grew up in Winston-Salem, they’ll miss having their Moravian Cookies and Moravian Sugar Cake around the holidays. Transport them back to their hometown, no matter where they are, when you send a gift tin or gift box packed full of Southern charm right to their doorstep this holiday! Not only are you bringing them back to their roots, but you’ll give them the opportunity to share it (if they’re willing to!) with their family so they can discover the delectable sweets of Dewey’s Bakery too. Give a family gift which will bring them together and give them opportunities to bond. For instance, opt for an “old school” gift like a classic board game that’s fun for the whole family. Or find a way to make an exciting activity, like decorating our delicious Moravian Sugar Cookies in colorful icing. Then they can get creative, have fun together, and enjoy drool-worthy cookies no matter where they are. This holiday season, focus on giving magical moments, special experiences, and lasting-memories to encourage connection and bonding! If you want to share a taste of Winston-Salem with the out-of-towners on your list, we have combined your favorite baked treats to create the perfect gift boxes. They are the best way to gift the experience of Southern charm and hospitality all over the country. And you can ship these holiday treats for free with every order $24.99 and up! Shop our gift boxes now! This gift box includes a taste of each of our most beloved products! It’s the perfect gift for a friend or family member who has never tried any of our Dewey’s Bakery treats. Warning: You will be obligated to send Moravian Cookies to them regularly after they finish the goodies in this gift box. Make sure you’re ready for that commitment before you share a taste of Dewey’s Bakery with them! Shop the Best of Dewey’s Bakery Gift Box now! Our Taste of North Carolina gift box is great for anyone who grew up in Winston-Salem or North Carolina. Full of Southern charm in every bite, our cookies and crackers will transport them right back to their hometown, no matter where they are. Give a delicious taste of some of North Carolina’s most beloved products this holiday season! Shop the Taste of North Carolina Gift Box now! Do you have a family member who can’t make it home for the holidays because of their work schedule or other conflicts? 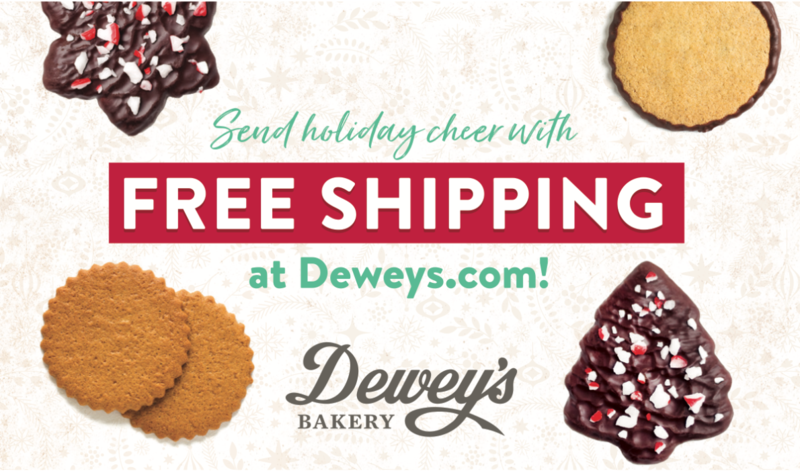 Don’t let them miss out on the taste of the holidays by sending them a gift box complete with every delicious Dewey’s Bakery goodies so they can enjoy their hometown bakery, no matter where they are. Show someone you care and will miss them this holiday season! Shop the Wish You Were Here Gift Box now! And don’t worry, if a particular item in a gift box is not available when you order, we’ll replace it with an item of equal value and deliciousness. Share the delicious taste of your hometown bakery with anyone, no matter where they are, when you send one of our perfectly curated gift boxes this holiday season!